Note: EIB financing has been allocated proportionately across EIB policy objectives where a project contributed to multiple objectives. One of the Bank’s targets is to ensure that at least 25% of total lending, across all its public policy areas, is devoted to climate action. In 2017, the EIB financed EUR 16.6 billion of climate action in the EU, representing 27% of all EU signatures. Regarding the EIB’s cross-cutting cohesion objective, EUR 18.3 billion of the EUR 62.4 billion signed in 2017 was for projects in EU regions classed by the European Commission (Eurostat) as being less developed or in transition. All EU countries benefited from EIB operations during 2017. The chart below provides a breakdown of operations by country and type of operation. 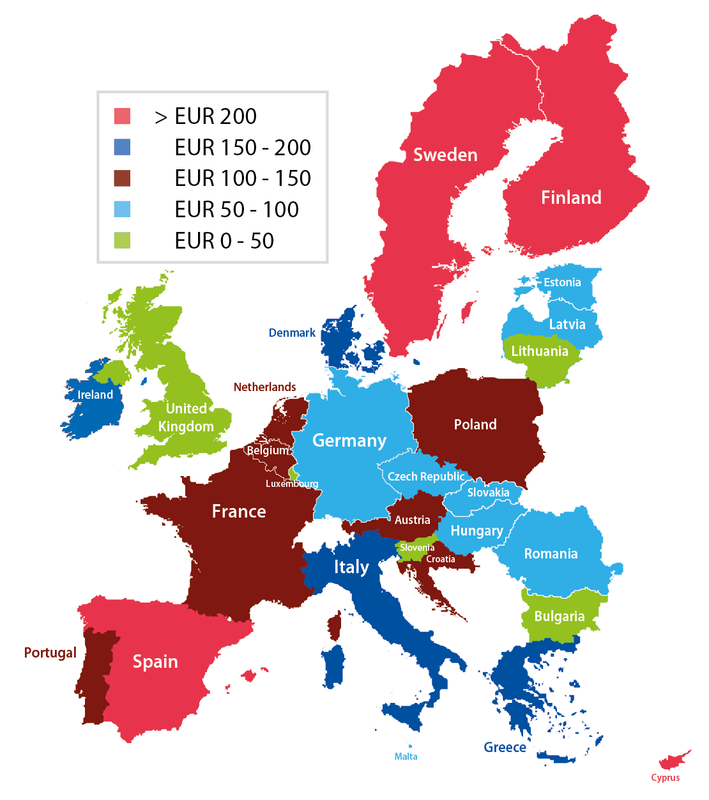 in 2017, the six largest EU Member State borrowers were Italy, Spain, France, Germany, Poland and Sweden. The UK had been the fifth largest borrower in 2016, but uncertainty as to the future relationship between the UK and the EU, and more specifically the EIB, saw the number of new UK operations drop significantly. Its place in the top six borrower states has been taken by Sweden. the only country not to take at least one investment loan was Luxembourg, and only Malta and Slovenia did not use the Bank’s MBILs, guarantees and equity-type instruments. The picture in respect of framework loans is more mixed but remains unchanged from 2016 with 18 of the 28 Member States using them. The level of lending activity in 2017 can be related to the population size of the various Member States, as illustrated in the map below. The amount of financing per capita is higher in Poland and in the southern European countries - especially Cyprus, Greece, Croatia and Spain. 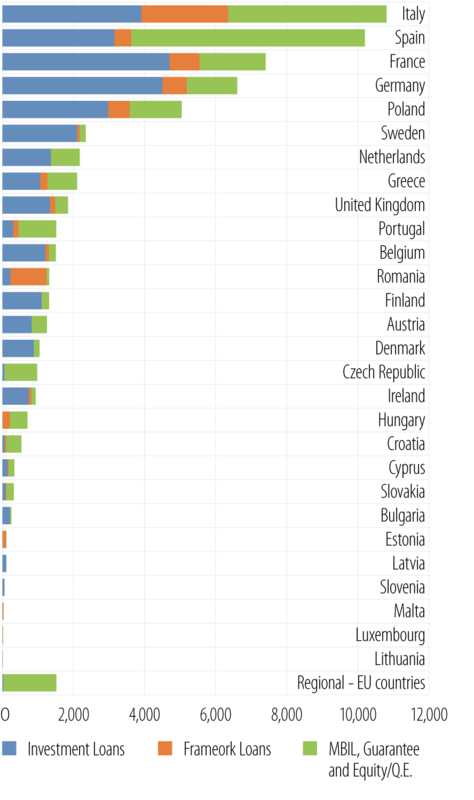 Note: Calculation based on the total amount signed by country in 2017 divided by the 2017 country population taken from Eurostat. A detailed breakdown of the EIB’s 2017 operations by types of intervention and EU Member State is provided in Annex 2. 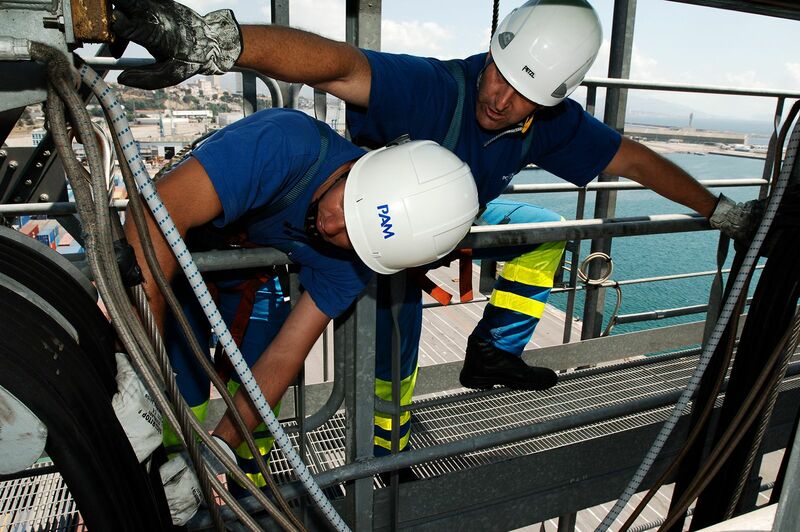 EIB operations create employment in a number of different ways. Firstly, there is the temporary employmentassociated with the physical implementation of the project. Most EIB lending is for the creation of physical assets, such as roads, schools, factories and flood defences. Building these will lead to the employment of construction workers in a given region. In addition, most projects will require plant and equipment to make them operational: production lines in factories, generating plant in power stations, furniture in schools and universities, etc. These will also create jobs. The EIB’s operations in 2017 are estimated to have supported some 900 000 temporary jobs across the EU Member States. The second type of employment impact attributable to EIB operations is the creation of and support for permanent, long-term jobs. The Bank’s lending in 2017 is expected to generate some 115 000 new jobs across the EU. These are direct employment effects due to activity or business expansion, but jobs are also created both upstream and downstream of the investment. Infrastructure investments can induce employment creation as businesses take advantage of the improved infrastructure to expand their operations and to trade more effectively and efficiently with key markets elsewhere. Similar types of effects can be found in the fields of innovation and skills, and the environment. Furthermore, some 5.5 million jobs are expected to be sustained. EIB investments in SMEs should enable them to innovate and grow, thereby creating new job opportunities. Although more difficult to measure, it is these longer-term direct and indirect, or induced, employment effects arising from EIB operations that are likely to be the most significant. Supporting jobs is, of course, vital given persistent high unemployment rates across many EU Member States, especially amongst young people. However, while creating assets creates temporary jobs – which will be sustained if economies continue to grow - sustaining and developing permanent jobs is arguably more important. Here the EIB can make a significant contribution to the development of the European economy. Its investment in innovation contributes to the development of new technologies that are needed to promote Europe’s long-term industrial competitiveness. Financial support for education helps to create the well-qualified workforce that is needed by modern economies as well as opening up employment opportunities for young people. Total temporary employment expressed in persons for the entire project construction period and based on all type of operations, i.e. including multi-sector and multi-objective loans covering access to finance to SMEs and mid-caps.